Here at Raval Facial Aesthetics, we love helping clients recapture and maintain a vibrant, healthy appearance. But no skin rejuvenation treatment can be successful long term if you don’t follow a daily care regimen. This is especially true in Colorado. We get to enjoy this amazing state but the climate can be tough on unprotected skin. That’s why we offer carefully-selected skin care products, including our own proprietary Raval RX line. Only the best ingredients, matched to your skin type, will provide optimal results. Did you know that the skin is our body’s largest organ? It’s a bit different for each of us, thanks to our age, skin type, genetics, and other individual factors. So while taking care of your skin should be priority #1, choosing the right products can be confusing. Our Raval team of skin care experts is happy to make recommendations, just for you. 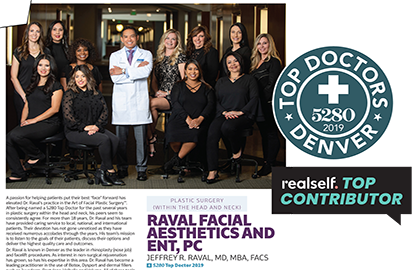 Raval RX is a powerful, comprehensive cosmetic line developed by our own Dr. Jeffrey Raval, exclusively for our clients. Each product is a synthesis of Dr. Raval’s medical expertise and aesthetic insight based on his experience. Each of the serums, essential night creams and moisturizers has been formulated using the highest quality, clinically-proven ingredients. EltaMD™ Sunscreens are formulated with transparent zinc oxide and are noncomedogenic, sensitivity-free, fragrance-free and paraben-free. All EltaMD sunscreens are recommended by The Skin Cancer Foundation as effective broad-spectrum sunscreens. Obagi® is a “for life” system brought to you by one of the leading specialty pharmaceutical companies, fighting hyperpigmentation, acne, skin aging, and damage. REVISION SKINCARE was formulated to provide targeted solutions for enhancing skin’s appearance and reducing signs of aging. SkinCeuticals is an antioxidant line designed to protect your skin from photo- and environmental aging through scrubs, masks, balms, interrupters, and more. Dr. Raval demonstrates the Rocky Mountain Melanage Peel. It helps with age spots, sun spots and fine wrinkling. It is beneficial for people with any skin type.